I have received several e-mail messages from people looking for a design for a very simple receiver. As most people reading this page, have access to a computer, I decided to use a computer sound card as the A.F. 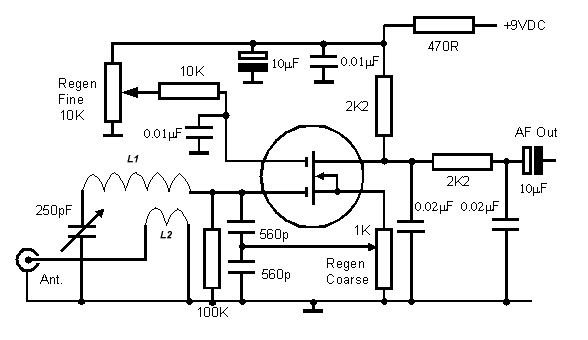 amplifier for a simple TRF receiver. To receive AM, set the fine Regen (Reaction) control to about half way, set the coarse Regen control to slightly below the point of oscillation. Tune in the AM station with the main tuning control. To receive SSB or CW, set the coarse Regen control to just above the point where oscillation begins. Tune in the SSB/CW station with the main tuning control. There is a lot of interaction between the three controls. Very strong SSB signals cause some frequency variation on voice peaks. CW and AM reception is very good. The selectivity is surprisingly good, for a receiver with only one tuned circuit. I use a 9 Volt battery (6F22 or PP3) as the power supply. If you use a mains supply, make sure that is well smoothed and regulated. DO NOT connect a high current supply to your computer mic. input. When receiving SSB or CW, some of the oscillator signal will be radiated by the antenna. In the valve (tube) era, regenerative receivers were notorious for causing interference. This is not likely to be a problem with this low power circuit. The radiated power should be less than 1 mW. AM. am.wav AM broadcast station from USA.